TO MY DARLING ONES IN JAPAN !!! I hope you are all having a wonderfully fabulous day. For your sake, I am. I am excited and happy to be writing this, my latest Blog, 103, for all of you, My Dear, Darling, Ones there in Japan. I am sending along Part 2 from last week’s Blog #102, which was: I HAVE HEARD RUMORS BUT………. As you can see from the subject line, the title of Part 2 is : BUT ARE THEY TRUE? BLOG: # 103 : BUT ARE THEY TRUE? My Darling Ones, I must admit that after reading that entire sentence, it has made me wonder as well, whether the rumors are actually true or not. You see, My Darling Ones, last week when I began the writing of Blog # 102 it was intention to write about The Day Before Lent which is known as Mardi Gras or Fat Tuesday. But as it turned out, I did not get to say much about that part of it last week. I happily, got myself carried away with Lent itself and what I should give for Lent. And naturally, since I wrote my last Blog I have been thinking about that I am hoping I can fit that in here some way while writing this. If you look up the meaning of the words MARDI GRAS in the dictionary, it will tell you that MARDI GRAS is: the last day before Lent; a day of Carnival in New Orleans. Now as all of you know, all my Blogs are true. Nothing is made up. So, this Blog is kind of hard to write, because you see, I have never actually been to the MARDI GRAS in New Orleans which kind of puts me in a really tough spot here because I do not wish to get anybody into any kind of trouble. So, what can I say of it actually? It is such a huge affair and yet I can hardly say a thing about it because as I said, I have never attended the event. I can only say what I have seen on the television news. But I would really like to go to one. There was one time I told you about a certain Blog, # 12 titled, CAREER DAY which dealt with going to classes which spoke of careers for students just getting ready to graduate from High School and could turn into serious job careers for them. And I choose JOURNALISM for me. And I was really interested in it until I discovered I would rather WRITE STORIES THAN REPORT ON THEM. Well, I think the only except I would make would be reporting on MARDI GRAS because I feel that would be fun. From what I understand and have heard, Mardi Gras, the last day before is one big party all day and night long until Lent (Ash Wednesday) begins. They have a huge parade and throw the beautifully colored (purple, green, and gold,) Mardi Gras beads to people standing in the streets as the floats in the parade go by. And you are really lucky if you catch one or more of them. I have some of my own but they are not the real ones from New Orleans I don’t think. But they are the colors of the beads and that is what counts and if I can find them, I will wear them on Fat Tuesday, no matter what else I may have on at the time and I will wear them all day. And of course, there is the matter of The King Cake. This cake is made of the colors of the Mardi Gras beads and baked inside the cake is a very small plastic baby doll. And it is said that the person who gets the slice of cake with the little baby in it is the next person to bake the next King Cake at the next carnival party. Naturally everyone is in costume, right down to the beautiful feathered Mardi Gras masks and there is dancing and drinking in the streets. 6 March until 17 April. After this is HOLY THURSDAY, GOOD FRIDAY, AND HOLY SATURDAY which is NOT a part of Lent but of the Vigil of Easter and Easter Day itself. The celebration of Easter lasts 50 days, ten days longer than Lent. Anyway, if you have never been to the real Mardi Gras, I think you should go and celebrate for one time in your life. In fact, I think we should all go. I know it would bring new meaning to my life as well as my many more to come ASH WEDNESDAYS and my LENTS. Perhaps I will go one day. And see it all for myself. 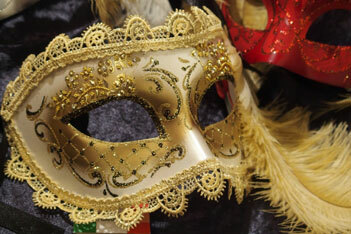 Happy Mardi Gras Everyone And A Blessed Lent!